Want a creative way to leave messages to your girlfriend? 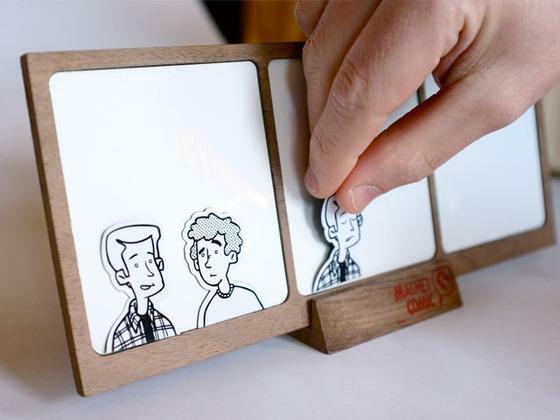 Take a look at Magnet Comic, the customizable dry-erase comic strip should be able to catch your eyes. The Magnet Comic is creative dry-erase comic strip designed to offer you a unique way to leave messages, expressing your feeling, and etc. 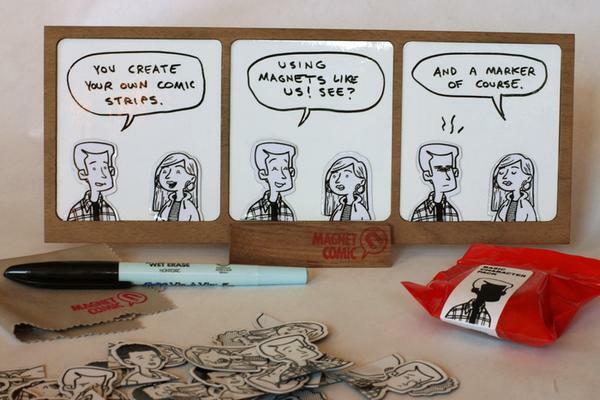 As we can see from the images, the magnet comic includes a walnut wood comic strip with dry-erase panel, using an accompanying dry-erase marker, you can easily write your message, notes and more on the panels, of course, don’t forget to enrich your comic strip with those interesting character pieces. The magnet comic comes with a basic pack of 4 characters, and each character has 9 different facial expressions in order that you can use them to express various feelings, while the magnets on the back of the comic strip allows you to attach it onto your fridge door just like a fridge magnet. Apart from that, they also accept customizable character design based on your photos or descriptions. At present, the inventor of Magnet Comic is raising fund at Kickstarter. Pledging $35 will let you own the magnetic comic strip and an additional set of blank characters. If you’re interested, jump to Kickstarter official site for more details.